During our trip to Crescent Head recently we spent some time driving down the beach to Coffs Harbour. Along the beach, Stan (the Tan Lexus) struggled more than I thought he should on the soft sand. I had let the tyres down, but only to about 23psi as this is what the Staun deflators were pre-set at. I also didn’t engage the centre diff lock, which also turns off the traction control. 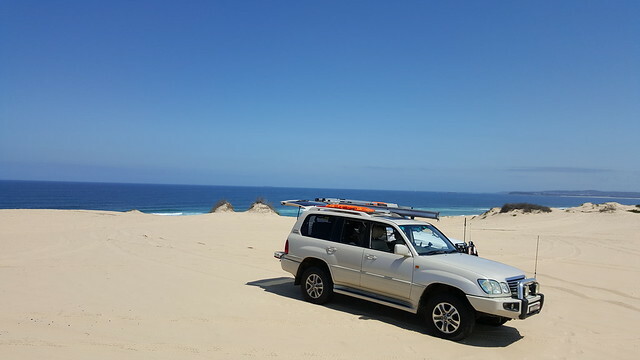 I was pretty sure that the struggles were all due to user error, but was keen to have another run on the sand before we head up to Stradbroke Island in the next holidays with the camper in tow. A testing weekend was called for. Trent and I headed north just before lunch on Saturday and about an hour and a half later, we were airing down ready to go onto the beach. Trent had put a couple of pies into his 12 volt pie oven, so we enjoyed those before heading off. 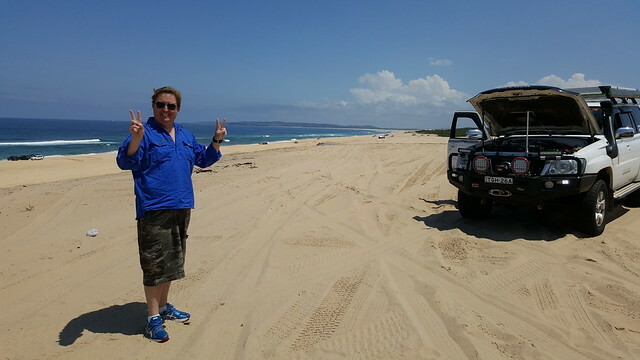 Tyres at about 18psi this time, and diff lock engaged, Stan was awesome and just floated above the sand. 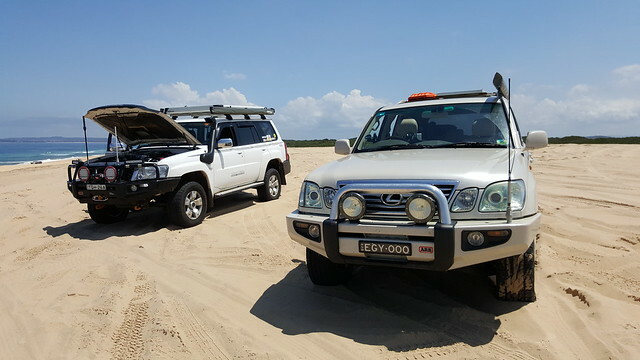 We drove the length of the beach, before heading into some of the dunes behind for a bit of a play on some more challenging sections. Again Stan charged up the hills, with some more aggressive use of the go pedal, he was never really challenged. Sure, we didn’t try anything too crazy, but I was now comfortable that our previous issues were indeed user error. Once satisfied, we left the beach, aired up again, and drove down the road a little to Canton Beach Holiday Park where we were staying the night. 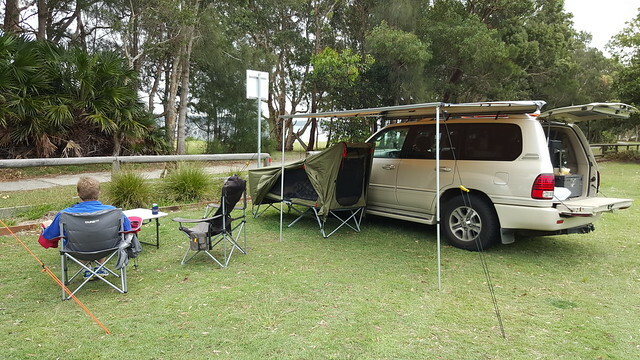 A quick setup of just the awning and Jet Tent Bunker and some cold refreshments were served up. 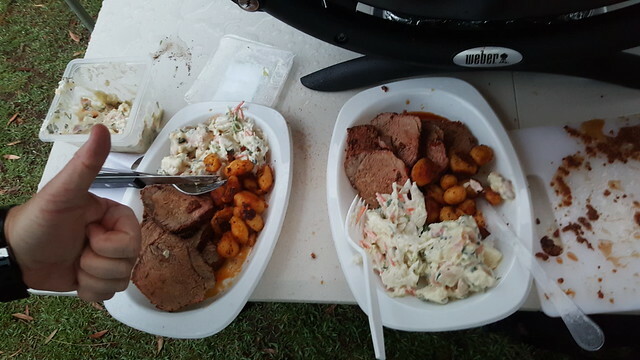 Not long after the Weber BBQ was put to use for some Chorizo, followed by a pre-marinated peppered Beef Roast, with baby potatoes and coleslaw for dinner. Yes, it tasted even better than it sounds. After dinner, Trent decided to head home, given some sinus issues, and also having to head to Tasmania early on Sunday. This left me along to finish a couple more beverages, and have a nice quiet night listening to the rain fall on the roof. This was only my third night in the bunker, and it is great to sleep in. 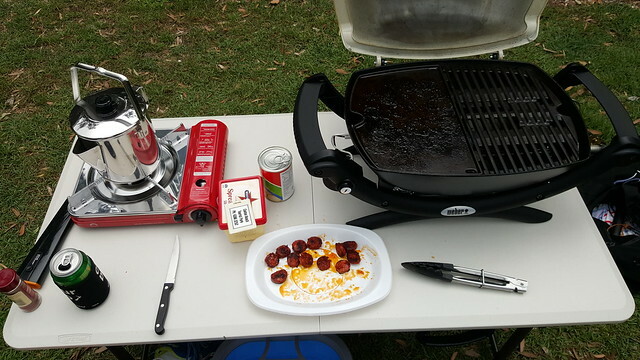 Plenty of room, toasty warm, and super quick and easy to set up. Just perfect for those quick weekend trips away. It was still a little damp when I packed away, so had to get it out again when I got home. Trent and I are planning to take the kids to Blacksmiths sometime in the future as they will love it here too. Ahhh… this is the life! No more trips now until our big trip at Christmas… stay tuned to hear more about that as we go.